Constant practice makes a work perfect. So to be able to learn skills in HTML, you need to practice more activities related to it. I have here simple activities to create a simple form that uses HTML5. 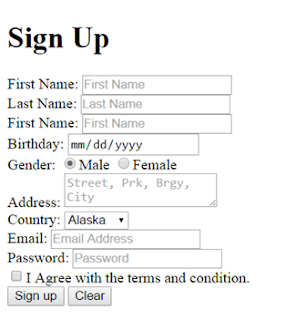 This is important especially if you want to later on create a database-driven web sites since HTML will serve as your front-end or your graphical user interface (GUI). Create a webpage like the picture below using the different HTML tags. Use the appropriate input controls provided below with their corresponding placeholder if applicable. For another activity, create a simple contact us form like on the image below. You can apply styles using CSS to make it beautiful if you like. Make sure to markup all your html tags properly.